The Skin Back Alley Sonisphere playlist! Glastonbury Schmastonbury! Tour De Who?! Metalheads’ sights are now firmly set on this this weekend’s Sonisphere festival! The show at Knebworth Park is set to see performances from a raging horde of metal’s finest, including Glastonbury conquerors Metallica with their By Request set, UK new wave legends Iron Maiden, thrash merchants Anthrax and Slayer and whole bunch more! So what better way to get yourself into the metal mood (like you needed an excuse!) than with Skin Back Alley’s very own Sonisphere Spotify playlist?! Click through below to get your metal mosh on! 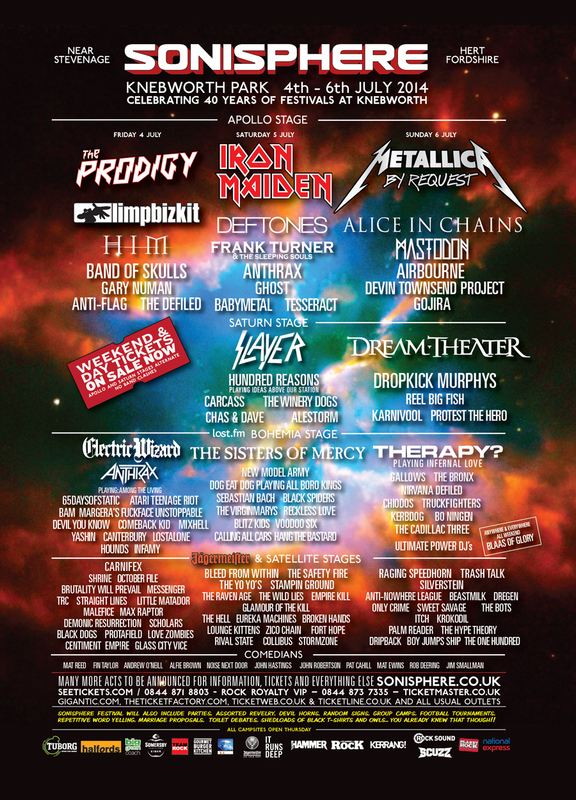 Find out more about this weekend’s Sonisphere festival at their official website, and check out the full line up below! 2014, Alestorm, Alice In Chains, Anthrax, Deftones, Devin Townsend Project, Dream Theater, Dropkick Murphys, Frank Turner, Gojira, HIM, Iron Maiden, Karnivool, Limp Bizkit, Mastodon, Metallica, Playlist, Reel Big Fish, Skin Back Alley, Slayer, Sonisphere, Spotify, The Prodigy, The Winery Dogs, Therapy? Next:Under The Skin: Dear Ben Nichols, what’s in a name?